Your puppy will already be microchipped if you purchased your new pet from a registered shelter or pet shop. Your puppy will have only been microchipped from other sources if you have a microchip certificate or documentation that presents with a unique 15 digit number, within Australia. RIGHT EAR: Some Veterinarian Surgeons apply a tattoo with the letter “M”to the inside flap of the right ear, whilst the animal is under general anaesthetic. This states a microchip has been implanted under the animals skin between the shoulder blades. LEFT EAR: When an animal is desexed, your vet applies a tattoo with a symbol of a dotted circle and a dotted line straight through the circle. This states that the animal has been desexed. The microchip is a small silicone chip which is implanted under the skin of your puppy, between the shoulder blades and is the size of a grain of rice. It stays there for the life of the animal and in some cases may “migrate” or move under the skin from the shoulder blades to under the belly or down under the groin area and sometimes the leg. Normally each vaccination and then yearly is suggested as a good practice to have your animals microchip scanned to ensure it is still in the correct scanning region. Underneath the belly or outside the above regions. In some rare instances, a new microchip may need to be inserted, if the microchip has moved out of the region. 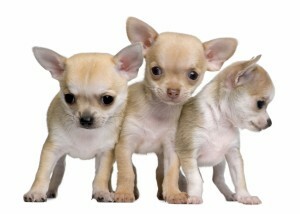 It is a legislative requirement (in Victoria) for the owner of a puppy from 8 weeks to be microchipped prior to sale. For more information visit the VIC DEPI website. Please note each state has different legislation regarding microchipping. Microchipping your puppy provides peace of mind, knowing your puppy will have a greater chance of being reunited with you. However your puppy cannot be relocated back to you if you have not kept your details up to date with your Microchip Registry Office. Always notify the registry office who are holding your records if you have changed any of your details. Written by Narelle Sillitoe , Mobile Microchipping. Narelle is an Authorised Microchipper and has microchipped many Puppies/ Dogs, over the past 5 years.